Click here to read last week's Bygone Bestseller: Edna Ferber's GIANT. THE THORN BIRDS is behind JAWS as the #6 bestselling novel of the 1970s in the USA. It is the decade’s top seller by a female author. 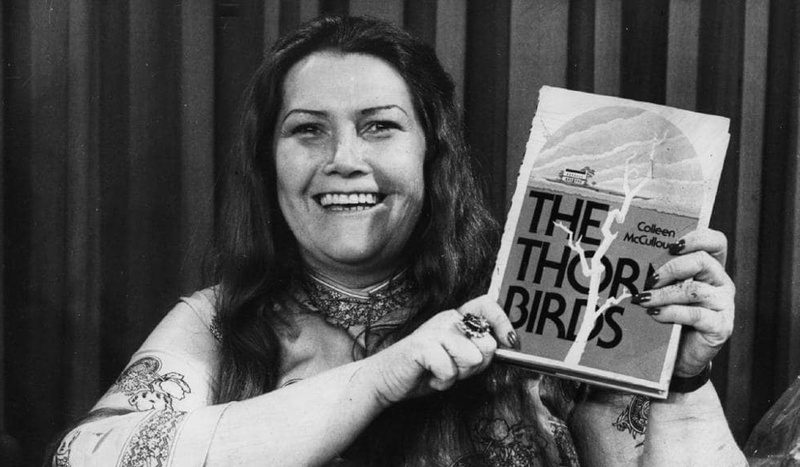 Colleen McCullough published two dozen more books, but none sold 30 million copies like THE THORN BIRDS, nor were they adapted into a miniseries second only to ROOTS as a historic TV ratings success. Not bad for a book written in McCullough’s off hours when she was a research assistant at Yale. McCullough’s writing is OK, but her plotting and themes are remarkable. This is one of those cases where a journeyman author constructs a story with the whiffs of legend. In an essay, the brilliant Germaine Greer calls THE THORN BIRDS “the best bad book I ever read.” The flaws she cites are primarily about the book’s depiction of its setting, the Australian outback – not its storytelling. After describing how she stayed up all night with the book, “utterly engrossed,” Greer let slip that she has read it again in recent years and felt the same. She finds more “best” than “bad” in THE THORN BIRDS. That’s about right.